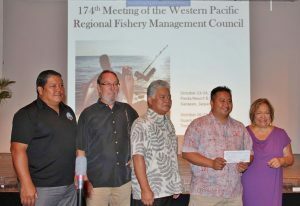 GARAPAN, COMMONWEALTH OF THE NORTHERN MARIANA ISLANDS (23 October 2018) The Western Pacific Regional Fishery Management Council opened its 174th meeting yesterday in the Commonwealth of the Northern Mariana Islands (CNMI) with the presentation of a check for $250,000 to Gov. Ralph Torres and Department of Lands and Natural Resources Secretary Anthony Benavente. The funds stem from the 2017 bigeye fishing agreement between the Commonwealth and Hawaii longline vessels. (from right) Council Executive Director Kitty M. Simonds presents $250K check to Gov. Ralph Torres accompanied by CNMI Senate President Arnold Palacios, Council Acting Chair John Gourley of CNMI and CNMI Department of Lands and Natural Resources Secretary Anthony Benavente.